ECO Net stands for Education, Communication, and Outreach Network. An ECO Net exists in each of the 12 counties surrounding Puget Sound, highlighting the regional approach necessary to protect such a vital and far-reaching resource. ECO Net members represent a diverse cross-section of stakeholders that collaborate on outreach and projects aimed at improving environmental and community health. Members share resources and knowledge, and coordinate efforts to leverage and strengthen local programs for a greater community impact. 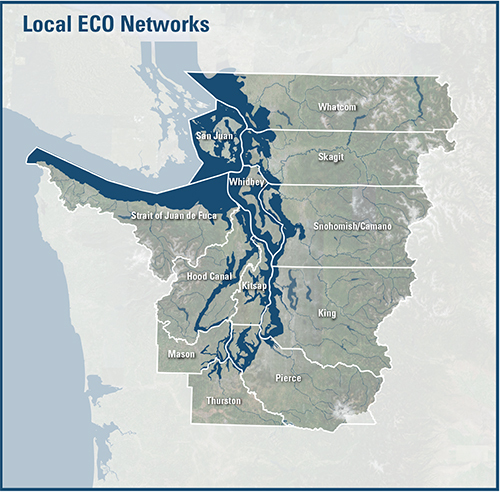 There are twelve local ECO Net chapters across the twelve-county Puget Sound region, including the King County ECO Net. Each local chapter has an elected coordinator. Member meetings are held several times each year. These local ECO Nets are designed to serve the specific needs of their membership, with network structure varying county to county. Members can also take advantage of regional resources including funding, research, community events and a comprehensive vision for restoring Puget Sound. Although some ECO Nets existed previously by other names and structures, the Puget Sound Partnership, in recent years, provided a period of funding and program support to each of the 12 networks. Kristen coordinates education programming for both youth and adults for the King Conservation District. She works with elementary and middle schools delivering stormwater education programming, assists with the Envirothon program, and coordinates freshwater and marine shoreline education for landowners. She also oversees agricultural education for landowners, including farm tours and classes on emerging topics. Kristen hails from California, where she studied Natural Resource Management at Cal Poly, San Luis Obispo. She spent time working as a science educator at Lake Tahoe in between skiing and mountain biking. The Washington Conservation Corps brought her to Washington and the King Conservation District in 2014. Her main goal as the ECO Net coordinator is to focus on strengthening the great connections and partnerships that are so valuable to our education, communication and outreach community.